The aerospace industry utilizes an extensive array of technologies in its constant quest to improve vehicle control, efficiency, range, payload and lifetime. Materials science, communications, aeronautics and engine/propulsion technologies are all critical fields of research and each use electronic signal testing to help determine performance. For example, in material science new products and compounds need to be characterized and qualified to understand how they will perform in different situations. To do this engineers subject the materials to numerous tests to find out their behavior under various conditions such as stress, strain, vibration and temperature. Sensors for key parameters such as strain, force, and acceleration produce electronic signals that all need to be captured and measured. Other technologies such as ultrasound, laser and radio waves may also be used to assist in observing the behavior of the material as it undergoes destructive or non-destructive testing. 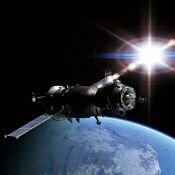 To cover the broad range and diverse nature of the electronic signals found in the aerospace industry Spectrum has an extremely wide range of digitizers and arbitrary waveform generators. The products are available in a variety of popular standards including PCI, PCIe, PXI and LXI. They offer bandwidths from 50 kHz to 1.5 GHz, sampling rates from 100 KS/s to 5 GS/s, and resolution from 8 up to 16 bits. When large dynamic range and maximum sensitivity is required high-resolution 14 and 16 bit digitizers are available for the capture and analysis of signals that go as high as 250 MHz in frequency. These high-resolution products deliver outstanding signal-to-noise ratio's (up to 72 dB) and spurious free dynamic range (of up to 90 dB) so that small signal variations can be detected and analyzed. They are ideal for use with the sensors found in mechanical testing systems or with the transducers used in ultrasonic systems. The higher frequency products are well matched for applications that employ RF and radar signals such as those found in aircraft tracking and guidance systems, surveillance, radio and satellite communications and even electronic warfare. With large on-board memories (up to 4 Gsamples/card) and advanced streaming and readout modes the digitizers are ideal for capturing the long and complex signals found in these fields. In fact, by streaming acquired data over the fast PCIe bus of the digitizer to a RAID based storage array, it's possible to seamlessly store hours of information. Typical aerospace applications include aeronautical engineering, satellite communications, guidance and tracking systems, destructive and non-destructive materials testing, propulsion and engine testing, surveillance and electronic warfare, impact studies, mechanical testing and vibration analysis. The use of Ultrasonic products is increasing as new techniques and improvements in instrument performance constantly expand the range of applications. 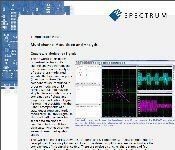 Spectrum digitizers are ideal tools for making ultrasonic measurements and can play a key role required in the development, testing and operation of these products. Spectrum digitizers and arbitrary waveform generators offer a wide range of bandwidths, sampling rates, and dynamic range to match the broad spectrum of ultrasonic measurement needs.